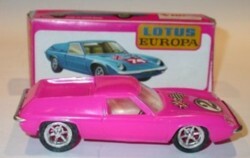 A rare Entex kit, the artwork is nice, the kit is OK, but the nose is a little too heavy. Here is another of those delightfull Hong Kong models. The artwork is typical of the period. In some ways, this a very similar style of box to the Revells kits shown on the right. 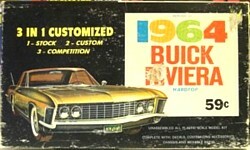 Back in the late 50s, Revell launched a serie of 1/32nd kits of recent American cars. This is one of them, I believe it is a 1960s reissue. All of them had nice artwork. Some of those kits have been reissued very recently, they are difficult to find, but well worth tracking down. This is not a slot kit, as you may have thought. 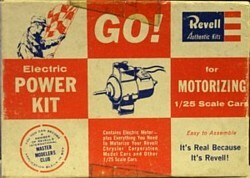 It is a kit designed to motorize you "Promo" cars, there is no provision for a guide blade. 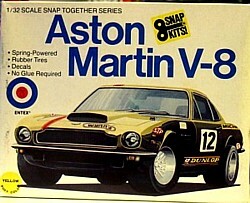 Here is another Revell kit, the originals can be quite expensive, but every now and them they can be found cheaply, as this one was.